Two things bugged me about the last post and, as with many important points made in writing, they received attention only in the two footnotes. After a bit of reading around I've managed to assemble some data on exports of oil and gas from the North Sea industry and outflows from the Scottish economy to the foreign sector. I'd recommend reading the previous post if you're not acquainted with the concept of sector balances. About 80% of North Sea production is currently in waters that are closest to the Scottish coast and it's thought by most commentators that this geographical share would belong to Scotland if independent. So it's interesting to consider how the balances presented previously change if this geographical share is included. With the caveat that there are significant uncertainties involved — and it could be several billion pounds either way* — here is my attempt to construct these balances. To save flicking back and forth, here's the onshore version of this graph from the previous post. For brevity, I'll refer to the one above as wNS (with North Sea) and the one below as onshore. The two graphs are obviously quite different. The main difference is that the onshore version shows a large but fairly constant trade deficit (the blue foreign sector balance is positive), whereas the wNS one has a smaller and more volatile trade surplus. This is because North Sea exports have historically been very large and variable. The public balances in the wNS graph are smaller than those in the onshore graph because of North Sea tax revenues which are (mostly) levied as a percentage of profits. 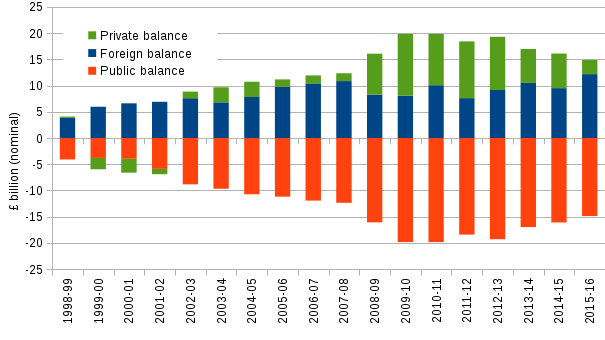 In the boom years this led to wNS public balances being improved by £10 billion or more over onshore balances. Following the oil price drop in 2014/15, profits and so tax revenue sunk to almost zero. For 2015-16, the wNS public balance was improved by a miniscule £0.06 billion over the onshore balance. A crucial point to appreciate is that although exports have also fallen with oil price to about half of their 2008-09 peak, they remain substantial and nowhere near zero. The bulk of the flows into the Scottish economy from North Sea exports are into the private sector, and so the wNS private balance is large and highly variable. Note though that both graphs show the private balance expanding in response to the 2008 financial crisis due to a desire to save money when faced with an uncertain future. The wNS private sector balance is overstated because some of it is sent to the foreign (private) sector to pay foreign employees and owners of North Sea companies (called factor income). For 2010 this amount was estimated to be £7.8 billion, of which £5.4 billion was related to North Sea activity. Unfortunately this is rather uncertain and estimates are not available for any other year. Although we can only correct the graph for 2010-11, we can use that correction to make a rough prediction for following years. North Sea exports have decreased since 2014 due to the fall in oil price. So if the actual wNS foreign balance was about zero a few years ago, it is almost certainly positive now, meaning that it constitutes a net outflow from the Scottish economy (i.e. a current account deficit). In other words, in recent years, and likely for years ahead, we would see the wNS graph looking more like the onshore one with blue and green bars being positive and the red bar negative. Although the red bars would be about the same length on both graphs (North Sea revenues are near zero), the wNS graph would have shorter blue bars than the onshore graph but larger green bars meaning a larger private sector balance. The last post concluded by pointing out that trying to reduce a fiscal deficit must entail reducing one or both of the private balance and trade deficit. This conclusion still holds true but as the trade deficit would now be relatively small (perhaps a few billion), it seems more likely that the private sector would bear the brunt. an offshore petro-economy that's a net exporter. And these two economies pull the currency choice in two different directions. The onshore economy that's tied to rUK would benefit from using the pound, but an exporting oil economy would require Scotland to have its own currency that could respond to the volatile oil price and perhaps also fluctuations in the exchange rate with the US dollar in which oil is priced. Quite how that square could be circled is a subject for another post, but if you've a thirst for more detail I recommend reading what Angus Armstrong wrote in 2013 and Ronald MacDonald's 2014 paper (full of typos I'm afraid). Both these articles were written before the 2014/15 fall in the oil price and the Brexit vote. Rather than render their arguments out of date, these events make them seem all the more vivid as they highlight the importance of currency. There's a fundamental reason why I think considering sector balances is important, but I'll leave that to a third and final (and shorter!) post. The easy, or at least easier part is the net fiscal balance. Data on this including a geographic share of North Sea revenue is given in GERS. Firstly, all the trade data, even with the onshore economy, should be regarded as quite uncertain. In the worst cases I've noticed revisions between quarterly publications of the Scottish National Accounts of as much as several billion pounds (e.g. compare imports-exports between 2015Q4 and 2016Q1 editions). Unfortunately, the data on trade of North Sea oil and gas is both more complex and even more uncertain. In 2013, the Scottish Government published an experimental analysis of this for 2012 (though the news article about it on the Scottish Government website was deleted in the last five days for reasons unknown), and has since provided an updated report that gives data for the years 2000 to 2014. Although very interesting, it's not possible to simply add the North Sea trade data to the trade data from the onshore quarterly national accounts because the latter includes imports and exports between the North Sea region and onshore Scotland (see pages 18 and 19 of the report for more detail). However, drawing on a graph given in Armstrong and McCarthy (2014), with a sense check against the Scottish Government updated report, I was able to estimate the trade balance as shown in the blue bars of the wNS graph. Unfortunately, this data set was by calendar year whereas the GERS net fiscal balance is by financial year. Ideally this should be corrected if quarterly data is available, but given that calendar and financial years differ by only one quarter, the error involved (about 5%) is probably dwarfed by the larger uncertainties. The net factor income adjustment comes from the Scottish Government's attempt to estimate Scotland's Gross National Income or GNI for 2010. The GNI is similar to GDP except cash flows to foreign employees and owners are included. This work tells us that GNI is about £7.4 billion less than GDP for Scotland because that amount is flowing out as what's called a net factor outflow. Armstrong and McCarthy (2014) also estimate a further transfer overseas of £0.4 billion which gives the £7.8 billion figure mentioned above. There's an engineer's saying that goes "Faster. Better. Cheaper. Pick two." In politics you could say "Fiscal deficit, trade deficit, private savings. Improve two." This post takes a look at this for Scotland and offers an alternative perspective on Scotland's fiscal deficit. Data sources are given in the footnotes. We're using the term 'government' loosely here. Strictly, we should be talking about the public sector, which is all government bodies plus public owned corporations such as Scottish Water along with a population share of UK institutions such as the Bank of England. So if the public sector is spending £15 billion more than it pulls back in tax revenue, you might wonder who's lucky enough to be on the receiving end of that £15 billion. In other words, if the public sector's balance is minus £15 billion, who has a balance of plus £15 billion? When a teacher, doctor or nurse is paid, that's money going from the public to private sector. Likewise, when the government makes a payment to someone for their state pension or for housing benefit, that's a transfer of money from the public to private sector. In fact virtually all public sector spending goes into the private sector. So, would it be right to conclude that the private sector balance is about £15 billion? The answer is no. The reason is that there's another large flow of money out of the private sector (in addition to tax) that means the private sector balance is much less than £15 billion. This flow is caused by trade (which was discussed in this post). Specifically it is the amount spent on imports less what is received from exports, which for 2015-16 amounted to £12 billion. 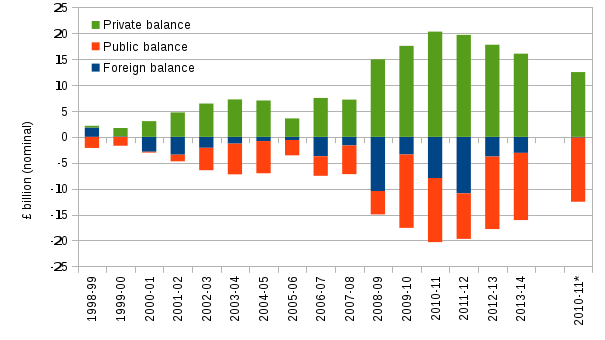 Scotland's public sector — government and public corporations — balance is minus £15 billion. Scotland's private sector — households and businesses — see below for its balance. By balance, we mean the income of the sector less its outgoings for a given year, which for these figures is the 2015-16 financial year. A sector with a positive balance is enjoying a rise in wealth over that year. If you consider these definitions, you'll notice that we've divided the whole world into three sectors and, so long as we discount the possibility of secret trade with Martians, the balances of the three sectors must add to zero. So, the balance of Scotland's private sector* must be £15 billion minus £12 billion which is £3 billion. What we have done here is construct a well known macroeconomic identity. That is, an equation that must be true by definition. The graph below shows the three balances for the last 18 years in nominal terms (i.e. not corrected for inflation) excluding the North Sea**. where the fiscal deficit is just the negative of the public balance (called the net fiscal balance in GERS), and the trade deficit is the negative of the foreign balance. The private balance is often referred to as something like 'net private sector savings' by economists but 'savings' does not have its everyday meaning, and can mean different things to different people. In macroeconomic terms it's best to think of 'savings' as meaning income that is not consumed. Consumption refers to spending on something that has no long term value, for example, buying a packet of crisps or toilet roll represents consumption spending, whereas purchase of a house or shares in a company does not. Do not read any causation into the way an identity is expressed. The second word equation may tempt you into thinking the fiscal deficit is caused by the trade deficit but no such inference can be made without more information. However, it is instructive to consider different scenarios. To provide some connection to the present reality let's keep one quantity fixed, change another and see what happens to the third. What this is telling us is that if trade were balanced and the private balance remained as it is now then most of the fiscal deficit disappears. Quite how this might come about is not easy to imagine. The trade deficit can be reduced by increasing our exports or by reducing our imports. If you look in your fridge, wardrobe, driveway, or inspect the device you are reading this on, you will appreciate the problem with the latter. The Scottish Government is very keen on upping exports but has not had much success in recent years. In fact, most developed economies struggle to find ways to improve their trade deficit as it is asking for both the private and foreign sectors to change their behaviour. This cure for the fiscal deficit means that the private balance takes the hit — quite a colossal hit if the trade deficit stays the same — and this is because, as John McLaren outlines, the government raises taxes and/or cuts government spending. Economic growth does not in itself change the argument (in fact McLaren's scenario assumes £3 billion of tax revenue growth) unless you can explain why exports or tax revenues see superior growth to imports and public spending. So, although caution is needed in reading cause into such an identity, we can be sure that Scotland's fiscal position cannot be changed without either the closing of the trade deficit or a reduction in wealth for households and businesses, or a bit of both. *Scotland's private sector balance as I've computed it here includes a component which goes to the foreign sector but not through trade. This is because foreign employees work and are paid in Scotland, but also because some private sector assets in Scotland are foreign owned and returns from these are sent abroad. Also, some Scottish residents receive income for working abroad and Scotland receives income for owning assets located abroad. Ideally this net income (denoted by Z in this blog post) would be separated out and added to the foreign balance as is done in computing the UK's current account balance. Unfortunately the Scottish Government doesn't publish this for Scotland. The other consequence of this is that the foreign balance here is just the trade balance. If these issues could be corrected, the foreign balance would be larger and the private balance smaller. This is considered further in the next blog post. EDIT 31/10/2016: Clarified and link to next blog post inserted. **Data on imports and exports for the North Sea are not available for Scotland, though an experimental estimate was published for 2012 (one of the North Sea industry's best years) by the Scottish Government. To remain consistent I have kept all figures in this post to the onshore values as published by the Scottish Government in the 2016Q1 national accounts (trade deficit) and GERS 2015-16 (fiscal deficit). Due to the fall in the oil price from late 2014 onwards, North Sea revenues have dropped markedly and profits are now near zero and so for 2015-16 there was almost no difference between onshore tax revenue and tax revenue including the North Sea. EDIT 30/10/2016: The link above to the Scottish Government experimental estimate news item disappeared in the last five days. I don't know why. The report it is based on is still there however. The Fraser of Allander Institute (FAI) published its report on how Brexit might affect Scotland this week. There were many such assessments for the UK before the EU Referendum, but this is the first that takes a detailed look at Scotland with economic modelling. Most economists agree that leaving the EU will hurt the UK economy because it will make selling our exports more difficult. There are of course societal issues too. To some people, EU membership is desirable as it brings with it such things as the freedom to move and work in any EU country. But others are concerned that the UK has lost sovereignty — the power to take the final decision in matters affecting its own citizens. And of course some worry that there is too much immigration. But societal and economic considerations are not entirely separate and immigration is one aspect that links them. In fact there's a surprising and important aspect in the FAI's results regarding immigration, which we'll come to later. Firstly, let's deal with its main finding: as a result of Brexit, in 10 years time Scotland's GDP will be 2% to 5% below what it would have been if we stay in the EU. It's worth being precise on the terms here. Firstly, the statement is concerned with onshore GDP only, mainly because the North Sea bit of it is near impossible to predict over 10 years. Secondly, this is real GDP, meaning that it is corrected for the effect of inflation (changing prices). Finally, and I've seen much misunderstanding on this point, it's not saying GDP will be 2-5% lower in 10 years than it is now, nor is it saying the annual growth rate will be 2-5% lower. The statement on GDP, and all other quantities in question (wages, jobs, population), is relative to what it would be if we don't leave the EU. The impact depends on the type of Brexit: the 2% is soft, Norway-style Brexit and the 5% is hard Brexit where we default to the World Trade Organisation (WTO) rules. At present, hard Brexit looks more likely so I'll stick to the WTO scenario here. Consider this graph of real GDP. This is not from the FAI report but it illustrates what their 5% reduction in GDP looks like over 10 years. The blue line uses actual figures for real GDP in 2015 prices from the latest Scottish national accounts. The red line shows what might happen if we stay in the EU and GDP increases with a growth rate of of 1.6% per year — the average from 1998 to 2015 including the recession following the 2008 financial crisis. The green line shows what might happen if article 50 is triggered in early 2017 and hard Brexit commences in 2019. From then onwards, GDP grows at a lower rate of 1.1% so that we arrive at a GDP of £173 billion in 2029 which is 5% lower than the red value of £182 billion. Remember this isn't a prediction or a real run of a model — it's a plausible illustration of what the FAI's estimated 5% loss of GDP over 10 year might look like. The difference doesn't look so dramatic on the graph and you might be tempted to think: oh, Brexit, even hard Brexit doesn't look that bad. Well, there's some truth to that, but to appreciate the impact you need to look beyond just GDP. Now, if total income grows faster than the population, then people must, on average, be enjoying higher incomes. Of course, these incomes are not distributed equally, which is an important but separate point which you can read about in this post and the ones following it on Scotland's inequalities. To account for changes in population you need to work with GDP per capita which is just GDP divided by the population. This tells you the average income per person and is related to other measures of individual income. For example, GDP per capita was £27,300 in 2015 whereas the median income before tax according to the Annual Survey of Hours and Earnings was £27,710 in Scotland. The graph below plots GDP per capita. Each value on this graph is calculated by taking the value for that year from the previous graph and dividing it by Scotland's population. The population figures are from the National Records of Scotland and they provide projections for 2016 onwards which I've used for the EU scenario. 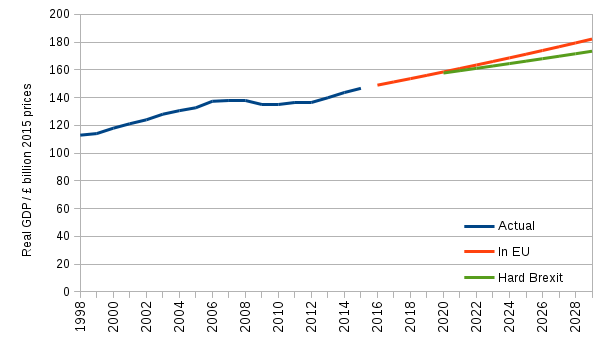 However, for the Brexit scenario I've only used those projections for 2016-19 and then set a population growth to match the FAI report's estimate that Scotland's population will be 3% higher in the Brexit scenario than in the EU scenario after 10 years. I'll come to why shortly. 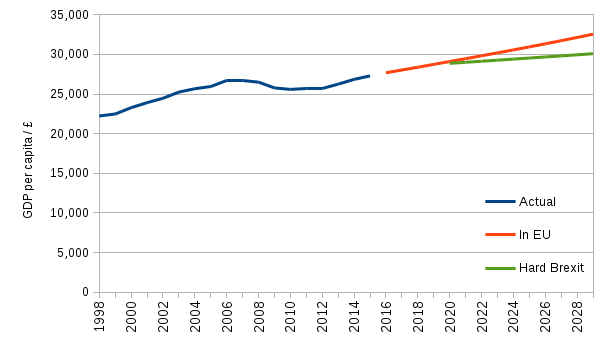 If you compare the two graphs you'll see that the GDP per capita gap in 2029 is larger than the one for GDP; this is due to the more rapid population growth in the Brexit scenario. To put it colloquially, not only is the pie growing more slowly but there are more people wanting a slice of it. So the slower growth of GDP and faster growth of population lead to 2029 GDP per capita being £30,100 in the Brexit case instead of £32,600 in the EU case. This is a difference of £2500 or 7.6% which chimes with the FAI report which finds a real wages difference of £2000 or 7.2%. The FAI model finds that Brexit will have a greater impact on the rest of the UK (rUK) than Scotland. This is because Scotland has a lower proportion of direct trade with the EU. According to the latest Scottish national accounts 16% of Scotland's total exports in 2015 went to the EU whereas 44% of all UK exports went to the EU. In fact, given that 64% of Scotland's exports go to rUK, a good part of the Brexit impact on Scotland will be from the slowing rUK economy rather than the impairment of its direct trade with the EU. And here we come to the explanation of why the FAI's model says that Scotland's population will rise faster in the Brexit scenario. The economy in Scotland will be in better shape than rUK's, including higher real wage growth, and that will cause immigration to increase from rUK into Scotland. There is a circular irony in the fact that concerns about immigration motivated some people to vote for Brexit and that in turn may actually cause immigration. The results from the FAI model are subject to the usual qualification of all else being equal or, if you prefer latin, ceteris paribus. For example, they assume there will be no significant fiscal intervention by the government, such as tax cuts or spending stimuli, nor any impact from new trade deals. Such factors could offset some of the loss of GDP and some proponents of Brexit, though very few economists, argue that it could boost GDP above what it would be if we remained within the EU. And there are many factors that could make matters worse. One concern is Brexit's effect on labour productivity — the GDP produced per hour worked — which underlies real economic growth. Productivity has failed to grow since the 2008 financial crisis in the UK and there has been speculation that Brexit may result in another impediment to its growth. There are many other imponderables. The value of the pound against the US dollar and Euro has dropped since the Brexit vote. Although this has the downside of making imports more expensive, it should also boost UK exports which will seem cheaper to foreign customers. It's too soon to conclude anything from the national accounts figures on trade as yet, but by early 2017 figures for 2016Q3 and 2016Q4 will become available. One interesting point that's addressed in the FAI report is what will happen if the £860 million per year — Scotland's share of the UK's financial contribution to the EU — is redirected to spending into the private sector by the government. The report estimates that by 2029 this will cause Scottish GDP to be higher by 1% or £1.8 billion (although this is estimated separately from the main modelling). The report doesn't mention it, but a significant implication of this is what might happen if, for whatever reason, the reverse happens and government spending falls. On top of likely cuts to already stressed public services — notably social care, the NHS and councils — a fall in government funding will reduce GDP and real incomes with it. The FAI's report tells us that Brexit is going to have a significant negative effect on Scotland's economy, but it is by no means catastrophic in itself. Rather, it suggests a dimmer economic future. To my mind, the bigger concern is that it will make it more difficult to weather other economic shocks such as that due to the fall in oil price, or some kind of repeat of the financial crisis of 2008. But of one thing we can be certain, it's highly unlikely that we'll see the nice straight lines I've sketched numerically in the graphs above. To a scientist, comparing two future scenarios like this is unsettling because only one of them will play out in reality and, short of an alternate universe, we will never be able to compare it against the other. In other words, we can never know whether the model's results are correct. will Scotland see better real wage growth than rUK? will Scotland's population growth rise due to immigration from rUK? I've given this blog a wee rest over the summer not just because I was busy with other things, but also because I wanted to take a step back and reflect. As I wake it up again I thought I'd share some thoughts on feedback I've received so far. This post necessarily has a lot of first person prose, but I'll return to the more usual style in future posts. You can read the 5 star reviews of the book over on Amazon, but most of the feedback I've received has been via Twitter because that's where I spent most time punting the book. Somewhat to my surprise the discussions have almost entirely been good natured and constructive. I've also had some feedback via email, and it's been a pleasure to meet a few folk in person who I've only previously interacted with across the internet. As pleasing as it is to receive praise, I'm much more interested in criticism, especially of the constructive variety. So far no one has reported any factual inaccuracies but I've been very grateful to those who've reported typos and areas which could be clarified. I've updated the book a few times now in response to these. I've been asked about my qualifications to write such a book. Well, aside from being an aspiring active citizen myself, I've spent most of my adult life explaining difficult concepts that I've managed to get my head around to people from a variety of backgrounds. To give a few notable examples: I've explained the big bang to primary school kids; neural networks to a sheet-metal worker who was made redundant; environmental science to people I'll never meet (via OU texts); and Einstein's relativity to a person whose autism meant that he rarely spoke to anyone (though I had the advantage of not knowing that when I met him). Taking information from jargon-laden specialisms and attempting to explain it clearly to diverse and unknown audiences has occupied a lot of my working life. One tricky issue that I've discussed with a few folk, and given much thought to myself, is my attempt to keep opinion out of the book. This presents two separate problems. A book that's not driven by opinion is a difficult sell. The best way to get attention is to make a clear but contentious statement of opinion, especially one on a polarising issue such as the subjects of the 2014 and 2016 referendums. Indeed, the posts with most attention on this blog have been when I deliberately wrote provocative posts (at least by my standards) on Scottish independence and the fiscal deficit. A few folk have told me, sometimes in roundabout ways, that I fail to appreciate that many people have an emotive approach to politics: they're not going to be rational or step through the facts as I try to do. Not only am I well aware of this, but it is precisely what motivated me to write the book in the first place. Rather than just sit on my arse and despair at the level of political discourse, I decided to educate myself using public sources of information and in so doing found myself writing a blog and then a book on what I was learning. Even if there is no strong opinion present to draw in the reader, I do hope it will help readers in forming their opinions. I know some may baulk at me saying this, but I honestly do not mind what people build on the work I have done, be it a case for an independent Scotland, an argument for staying in the UK or remaining in or leaving the EU. As long as folk engage with the facts all of these routes forward can be made to work; it's a question of weighing up the risks, rewards and sacrifices against what you want from society. In discussing our society a clash of opinions is inevitable, but political discourse can be improved by separating the debate on what are the facts (marred by tribalism and truthiness) from the more vital debate on the core values of our society. The latter debate is of course much more difficult because "we" do not have a common "want". It can be very hard to compromise on conflicting values, but it's not impossible. In fact it seems to me that people have more difficulty in thinking about compromise than actually doing it: a communist can work for Microsoft, a capitalist can work for a government quango, an anarchist might subsist on state benefits, and some Scottish nationalists are married to unionists, and some remainers to brexiteers. In reality, most of us are not really '-ists' of any kind. If you doubt that, consider why the use of an '-ist' label is often used in derision. So, yes, opinions do matter, and with them will come emotions that can disrupt constructive debate. But, neither the way society is now, nor the way people discuss it, is fixed. To believe these things are immune to change risks creating a self-fulfilling prophecy. We should not let our current opinions blind us to the problems and possibilities of society. Instead, if we're honest with ourselves, we can learn from the reality around us and let that shape our opinions. Have I been objective? Of course not. Although I aimed for objectivity I knew from the outset it was an unattainable goal. I have a set of values and opinions and they are both a help and hindrance. They allow me to decide what information is interesting and guide me in how best I might explain it, but equally I might unconsciously overlook data that does not fit my understanding, or give undue emphasis to facts that substantiate a prior belief. Constant policing by the conscious mind can keep the worst subjectivity at bay but I know from bitter experience that too much policing can also lead to a form of paralysing writer's block. Better to do something imperfectly than produce a perfect nothing. So, I have to satisfy myself with being honest about subjectivity. There are two ways to approach this. The first is to take a step back, hence the reflection I mentioned at the start of this post. I'm not quite the same person I was when I wrote the book, so now I can see flaws that were previously invisible to me. But of course it's far better for me to listen to others as they have the luxury of never having been me. 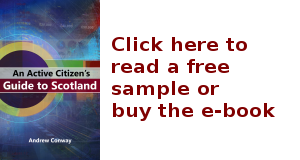 Readers who have shown an interest in the book and this blog seem to come from across the political spectrum and roughly equally from either side of the Scottish constitutional question. This pleases me far more than reading a 5 star review (but please keep them coming!). So, although I make no claim to being objective I can just about agree with one comment I received on Twitter that said I had "nae axe to grind". A few folk have noted my interest in economics. A few days ago I was even called a "wannabe economist". It's not possible to understand society without economics, nor is it possible to separate economics cleanly from politics. Even if we could agree on our wants for society, we cannot realise it without a functioning economy. Equally, what's the point in having a well-oiled economy that supports a society we do not want? To talk of society without referring to the economy makes as much sense as trying to understand the climate without physics. Still, I've seen people do both. But, as it happens, we live in a society that few are happy with and with an economy that's clearly been malfunctioning since 2008. In fact, it went wrong before 2008 but it escaped our notice. It has now become a right, royal question as to why economists failed to see that financial crisis coming. It's foolish to dismiss all economic theory and modelling as being worthless in light of this failure, but there's a need for some serious reflection in the economics profession. Unfortunately, this may take some time because, as the famous physicist Max Planck once said about his discipline, such change proceeds one funeral at a time. (Edit: I just checked and Planck's actual statement was in German and much less pithy). I was pleasantly surprised to find that there was one aspect of macroeconomics that was in robust health. Over the latter half of the 20th century, there's been a practical and useful interaction between economists and civil servants with the result that many countries have national accounts produced on a solid and comparable basis. Not only that but this rigour is reflected in the fundamentals of macroeconomics (specifically identities). So although the modelling and forecasting side of economics may be unable to properly describe our booming and busting economies we can have some confidence that we are at least doing a reasonable job of observing the macroeconomy. Unfortunately, many, if not most politicians let short-term interests and ideologies prevent them from learning from the valuable history of economic data that their civil servants and academics have been carefully documenting. Worse still, some politicians have successfully transmitted economic mythologies to the population to win votes using what Simon Wren-Lewis has called Media Macro. So yes, my take on Scotland's society involves a fair bit of economics, partly because it interests me but mostly because it's necessary. Also, I'd say I'm more of a hadtobe economist than a wannabe one. I plan to update the book in light of a year's worth of new data being made available in many areas. But, to be honest, adding one extra data point to each graph doesn't alter any conclusions significantly. What interests me much more is finding new ways to look at the information, and I've one or two blog posts in the pipeline that will do that. Hopefully they will find their way into a future edition of the book itself. One last thing. If there's something you'd like to suggest, contest or feel I've not explained well enough, please do get in touch with me via twitter (mcnalu), by email (twitter handle AT twitter handle DOT net) or in the comments of this blog. I will be grateful for any constructive criticism, especially if you convince me I was wrong. I'm doing this because I want to learn.